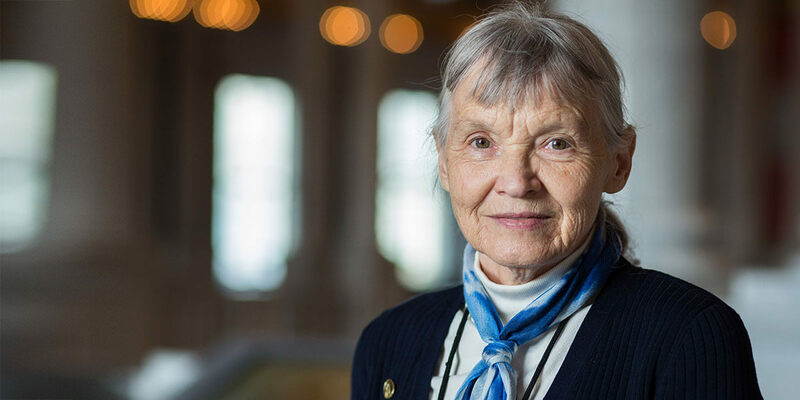 Joyce Longcore has been fascinated with chytrid fungi ever since she graduated in biology at the University of Michigan and worked in the lab of the renowned mycologist Dr. F. K. Sparrow. After taking a long break to raise her children, she returned to studying this particular phylum of fungi, discovering and documenting new species. But despite her success in publishing her work, funding was illusive. So Dr. Longcore ended up funding much of her own research. Then 20 years ago, Dr. Longcore got a call that would change the way the world saw her work. Frogs were dying off at the Smithsonian’s National Zoo in Washington, DC, and the veterinary pathologists were tracking down what was killing them. With her her expertise, Dr. Longcore was one of just a few people in the world who could help solve the mystery. And she did, isolating the pathogen her zoo colleagues would label Batrachochytrium dendrobatidis (Bd) – the first chytrid fungus identified that kills vertebrates. Bd was quickly spreading around the world, causing massive poplation declines among amphibians and threatening some of the 7,000+ species with extinction. Insights gained from Bd researchers nationally – funded by the National Science Foundation and the Smithsonian Institution and internationally – have led to policy changes in how animals are transported around the world, as well as research into ways to arrest this plague. As a mycologist and associate research professor at the University of Maine, Dr. Longcore, 79, continues to isolate and maintain chytrids in pure culture, making the Bd pathogen available to other researchers. Last month, Dr. Longcore and her colleagues who had worked at the National Zoo — Drs. 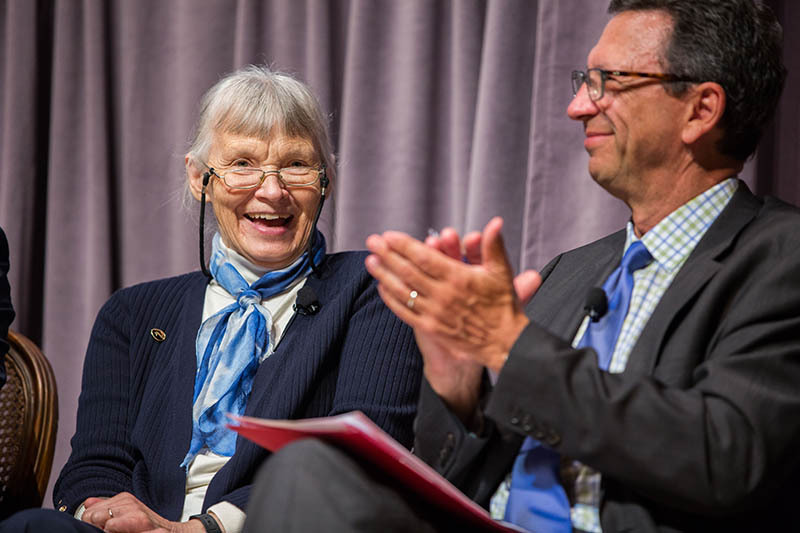 Elaine Lamirande, Don Nichols and Allan Pessier – were honored with the Golden Goose Award, which showcases seemingly obscure federally funded research that leads to results with significant societal impact. 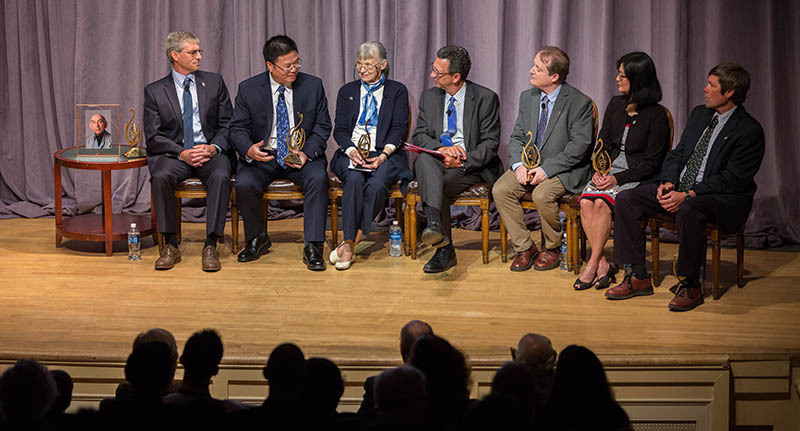 At the Library of Congress in Washington, DC, US congressmen and senators looked on as seven researchers were celebrated for their achievements, one posthumously. 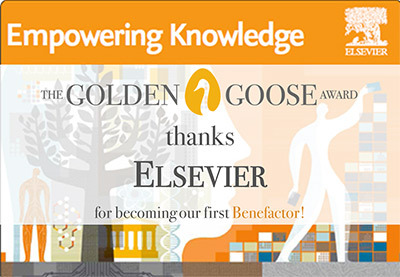 Elsevier supports this annual award as its benefactor, realizing that such recognition raises awareness of how research works: that scientific exploration – science for its own sake – can lead to serendipdous results with unimaginable benefits to society. In this case, had Dr. Longcore not been studying chytrids in depth, she would likely not have been in a position to isolate the killer pathogen into pure culture — a step that has enabled 20 years of research to follow. Advocating for basic research is what appealed to Dr. Longcore about participating in the Golden Goose Award ceremony. Recently, I interviewed her about her work. What fascinated you about chytrids when you started working in Dr. Sparrow’s lab? Probably that you have to hunt to find them; they’re microscopic. They’re interesting microscopic organisms, and I liked biology. Did you have any idea a species of chytrids would turn out to be harmful? No.It’s one particular genus that is harmful to amphibians, and that genus is Batrachochytrium dendrobatidis. Chytra means “little pot” in Greek (referring to the structure containing the unreleased zoospores), and Batrachos means “frog.” So Batrachochytrium is aptly named. The species name is dendrobatidis, and that is because the first pure culture of this particular chytrid was isolated from a dendrobatid frog. Dendrobatid frogs are the poison dart frogs – beautiful little frogs you see pictures of sometimes that, if they are eating the right kind of food, are poisonous. I and my colleagues from the National Zoo published a paper about the new genus and species (Longcore, Pessier & D.K. Nichols, 1999), but I made them pick out the names. What is so unique about the Bd pathogen? Is this the first and only chytrid pathogen to vertebrates? There are two now. There’s a second species of Batrachochytrium that has been found since Batrachochytrium dendrobatidis. It’s called Batrachochytrium salamandrivorans. It’s in Europe and it kills salamanders rather than being broad spectrum; as far as we know, it doesn’t kill other amphibians. But yes, when it was described, Bd was the only chytrid that we knew that was pathogenic to a vertebrate. Why was isolating this pathogen in pure culture so significant? It gives scientists the opportunity to study the organism with controlled experiments. 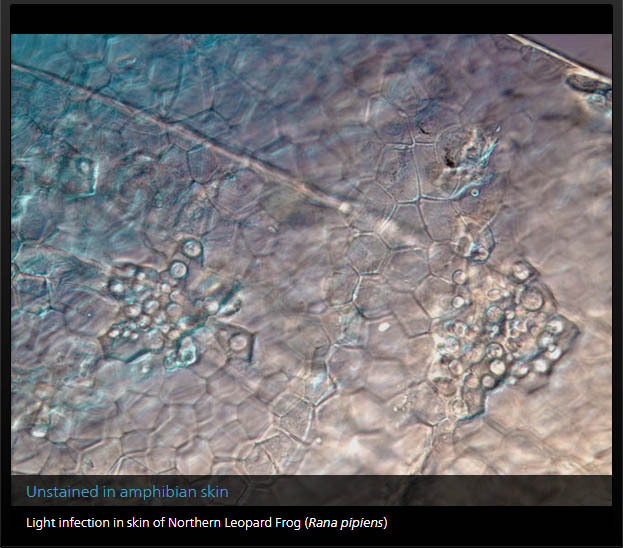 The Australians were working on this organism at the same time, and they had actually done some close work in as much as they had re-infected some frogs that did not have any disease with the skin of a frog that had the disease. Being able to use the pure culture opens up a whole range of research. People have used it to determine whether certain skin bacteria can inhibit the growth of this fungus; you can do this on a culture plate. They have used it to determine whether antimicrobial peptides produced by amphibians will inhibit the growth of this organism. They’ve used it to infect various species to see how tolerant or not tolerant of the organism it is. When I first isolated it and before we described it, at that time we weren’t using molecular means for description or deciding what order an organism belonged to; we were using electron microscopy of zoospores instead. A pure culture enables you to get massive numbers of zoospores to examine with electron microscopy. 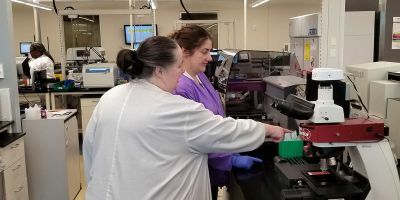 Having a pure culture has enabled whole genome sequencing to determine all the genes that are in Bd and compare those genes with genes of non-pathogenic organisms that are as closely related as we can find. Having a pure culture enables you to do molecular genetics to compare isolates taken from amphibians all over the world to attempt to find how and where this organism arose, and how different strains are related to each other. And what my colleagues, who do the molecular work, have found is that there’s a global lineage – what they call a global panzootic lineage – that is distributed all over the world. Continent-specific lineages also exist. You’ve made cultures available to other researchers. Have there been any promising “cures” or efforts to make amphibians more resistant? There are a couple answers here. Yes, you can cure amphibians in confined situations. So if a zoo brought in some amphibians, I think the first thing they’re going to do is test them to see if they’re carrying Bd, and if they are, then they’re probably going to treat them. There are antifungals such as Itraconazole and others. I’m not a specialist in that part. And amphibians can be heat treated by maintaining them above 30 degrees centigrade for a certain length of time. So yes, you can cure amphibians of Bd in captivity. What has been proposed is to take some of the bacteria that are antagonistic to the fungus, treat frogs and release them to spread that bacterial species through the community. But this has not gone beyond the research stage, as far as I know. So once a pathogen like this is loose and has been distributed, it’s hard to rein it in. What is the role of amphibians in the ecosystem? What would be the impact of their becoming extinct? To play devil’s advocate, organisms are becoming extinct all the time. Why are we concerned about amphibians? I’d rather you talk to an ecologist about that. I can tell you broadly that amphibians play a vital part in the ecosystem as food for other organisms and in controlling insects – their food. And although organisms go extinct all the time, this rate of extinction – of either local populations or whole species – is unprecedented. 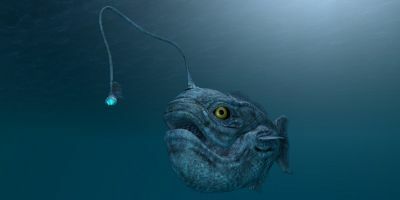 There may also be effects more subtle than extinction. In the Northeast, our amphibians are infected with Bd, but populations have not been extirpated. Still, low levels of infection may have fitness consequences; for example, the amphibians might be smaller at metamorphosis or more susceptible to predation, which could lead to smaller population size. Before you isolated the Bd pathogen, was there a direct application for your research, or was it more basic or exploratory? My research was pretty much basic. Up until the 80s, much research with Chytridiomycota had been: you see it, you draw a picture with the aid of a camera lucida on your microscope, and you publish what you found. Then beginning in the 80s, you had to get things into pure culture and do electron microscopy of the zoospores to get additional characters for classification. So that’s what I was interested in doing, and did that have any direct application? I can only compare it with how interested people are in hearing about new species of things that they can see and relate to — like birds and mammals. Well there are many, many more new species and unknown relationships in the Chytridiomycota, but people do not get excited about the information because they have no connection to the group — so studying chytrids may seem to have had little direct societal value. Knowing which chytrids exist in the world and categorizing them interested me anyway, even though my research didn’t have a direct application at that time. 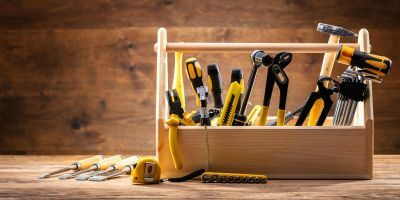 Did that make it harder to get funding for your work? Yes, pretty much I had no funding. As I told you, I was a stay-at-home housewife. I came back and got a PhD and I thought, ‘Well, I had always been hired on NSF grants when I was working for Sparrow; now I’ll just apply for an NSF grant and get money to do this research.’ Well, it’s difficult to get NSF funding, and I couldn’t do it. And so I said, ‘Well, OK, so we’d been accustomed to living on one salary. I didn’t have to work, and this is what I wanted to do, so I just kept doing it without funding. And, I would pick up a little bit of money here and there to support the lab by doing work for somebody, one thing or another. In 2000, once the Bd came out, then I had research funding as a co-PI through a grant to James Collins at Arizona State (University) for Bd research, and I was a co-PI for an NSF grant given to Martha Powell at the University of Alabama. 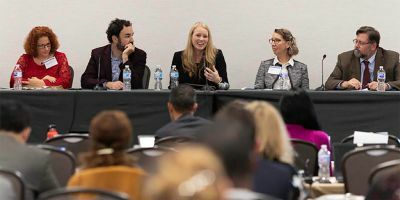 There’s been a growing trend to favor applied research over basic research – to fund research in which the results are likely to result in societal benefit. What do you think about that trend? Well that’s why I participated in the Golden Goose Awards. They asked me, and I’m not a great one for publicity or talking in public. But I will do what I can to promote basic research. … One of the other Golden Goose awardees stressed the value of smaller grants rather than grants that support huge projects. I’m sure there are exceptions but, in general, I agree. 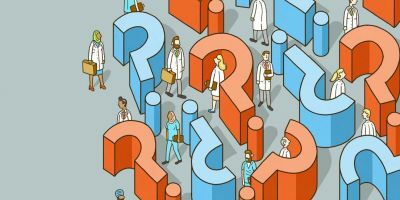 Are there any other reforms that would help get more funding for basic research – or more attention or understanding for basic research? My observation is that more scientists are studying ecology with fewer people doing basic research in the taxonomic diversity of a group. Research that seeks to identify and quantify the effects of members of an ecosystem with environmental DNA techniques, however, need gene sequences to be comparable to data in GenBank (the NIH’s genetic sequence database). Someone needs to know organisms well enough to add information from curated specimens to GenBank — and usually these someones are specialists in a group. Emphasis on ecology has led universities to hire more ecologists and fewer specialists. If I train a graduate student to be a chytrid specialist and that young PhD cannot get a job, then I’m not going to train another graduate student. … If we want to have specialists, jobs need to be there for specialists. 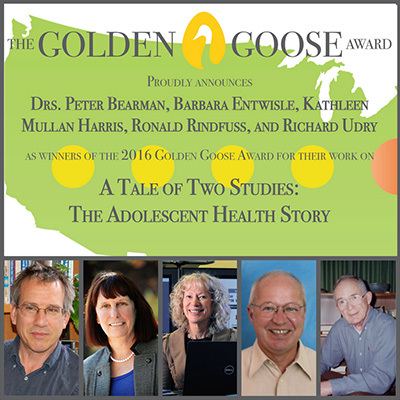 Does the Golden Goose Award help people – and politicians – realize that we often don’t know the value scientific research will have until it’s done? That, that is certainly the objective the Golden Goose Awards, and the Golden Goose award team does their very best to publicize the award stories. I think there were five US senators or representatives at the awards ceremony. But, how far down does the message reach or how far out from academia does it reach? I don’t know. I don’t think it gets to the man or the woman on the street. It’s been such a pleasure talking with you; it’s really an honor. Well, thank you. But as I say, I’m just an old lady sitting in a lab. ... But I am getting ready to send out 11 cultures to Cornell and three cultures to somewhere else and two cultures to Europe — so I do keep busy. 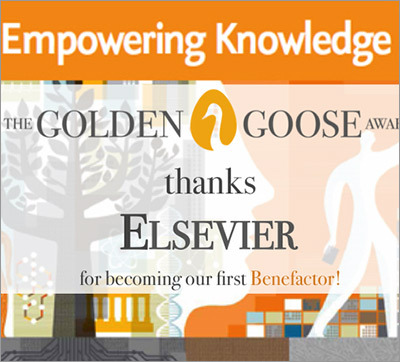 What is the Golden Goose Award? How can we work together to open science? As Executive Editor of Strategic Communications at Elsevier, Dr. Alison Bert works with contributors around the world to publish daily stories for the global science and health communities. Previously, she was Editor-in-Chief of Elsevier Connect, which won the 2016 North American Excellence Award for Science & Education. Alison joined Elsevier in 2007 from the world of journalism, where she was a business reporter and blogger for The Journal News, a Gannett daily newspaper in New York. In the previous century, she was a classical guitarist on the music faculty of Syracuse University. She received a doctorate in music from the University of Arizona, was Fulbright scholar in Spain, and studied in a master class with Andrés Segovia. Follow me on Twitter, Facebook or LinkedIn.